Cabbage is a leafy, green vegetable, available in several different varieties and prepared in several different ways including raw in salads or coleslaw, boiled in soups or stews, or pickled, as in sauerkraut or kimchee. 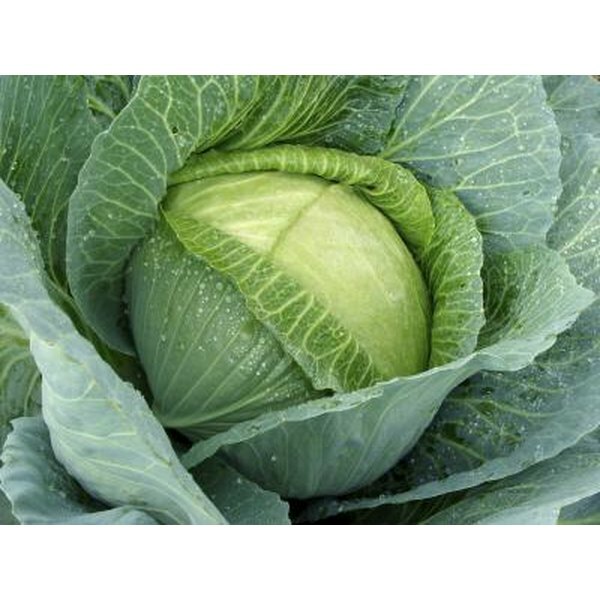 As part of a healthy diet, cabbage contains several important nutrients. The USDA Nutrient Database states that a 1/2 cup serving of boiled cabbage contains 81.5 mcg of vitamin K or around 80 percent of what the average adult requires as part of the daily diet. The Medical Center at the University of Maryland identifies vitamin K as a necessary component for blood to clot properly. A 1/2-cup serving of cabbage also provides approximately 28 mg of vitamin C, or over one-third of the daily recommended intake. The Colorado State University Extension indicates that Vitamin C serves as an antioxidant within the body, eliminating free radicals, harmful chemicals that can damage healthy cells. The vitamin is also important for healthy and strong connective tissues, blood vessels, teeth and gums, and assists in iron and calcium absorption and wound healing. The University of Illinois McKinley Health Center describes the vitamin folate as helping to generate new red blood cells and form the genetic materials RNA and DNA. Folate, when taken by pregnant women, can reduce the risk of certain congenital birth defects. A 1/2-cup serving of cabbage contains 22.5 mcg of folate or nearly 6 percent of the daily required intake of this vitamin. Cabbage also contains several other essential vitamins, although in smaller quantities, which can contribute to a healthy diet. A single 1/2-cup serving of cabbage contains 0.08 mg of vitamin B6 for 5 percent, 4 percent of both thiamin at 0.05 mg and vitamin A at 3 mcg, 0.13 mg of pantothenic acid for 2 percent and 0.18 mg of niacin for 1 percent of the recommended intake per day for adults.